FARMINGTON — Tractor batteries are charged, the grass is trimmed, historic displays are dusted and buildings are cleaned. It has taken months of dedicated work but organizers of the weeklong 178th annual Farmington Fair are ready to welcome fairgoers. The exhibition takes place Sunday, Sept 16, through Saturday, Sept. 22, with all of the usual displays, animal exhibits, horse racing, entertainment, and, of course, rides with Smokey’s Greater Shows. Tom White, superintendent of buildings and grounds, said major projects included rebuilding all of Section 1 and part of Section 2 of the grandstand. White said his crew has spent “quite a bit” of time preparing the New Sharon Library exhibit. The building dates back to at least 1860, said local historian and fair volunteer Don DeRoche. An Ideal Clarion wood stove that belonged to former librarian Faith Dyer is on display in the library. It is in the historical section of the fairgrounds next to the Red Schoolhouse and Blacksmith Shop. DeRoche will have a display of historical photos and artifacts in the seating area of The Ice Cream Shoppe food booth. Many of the photographs on display were captured by the late Barbara Yeaton, a local newspaper writer. “Niles Yeaton offered a lot of photos belonging to his mother. Her albums will be here for display so people can look through them,” DeRoche said. 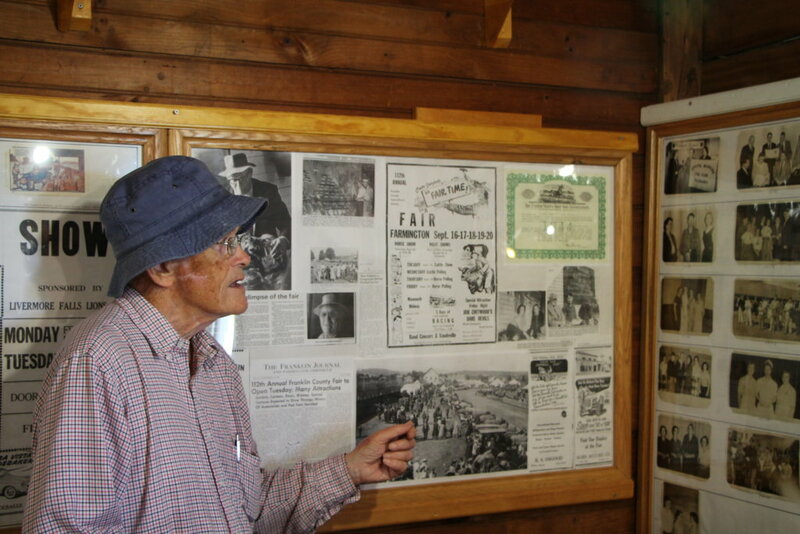 DeRoche’s display covers many themes, including fair history, former Mt. Blue High School basketball coach Jim Bessey and the 1950s. By setting up the display in the seating area, DeRoche is hoping to attract those who may need a place to sit and rest during the fair. He’s also hoping to attract young generations who may not initially be interested in history. “Once you get one person in and they find something interesting, they will go out on the midway and tell someone about it and, hopefully, get them in,” he said. DeRoche, who has been involved with the fair since the mid-1980s, said he has spent a great deal of time seeding and watering grass. 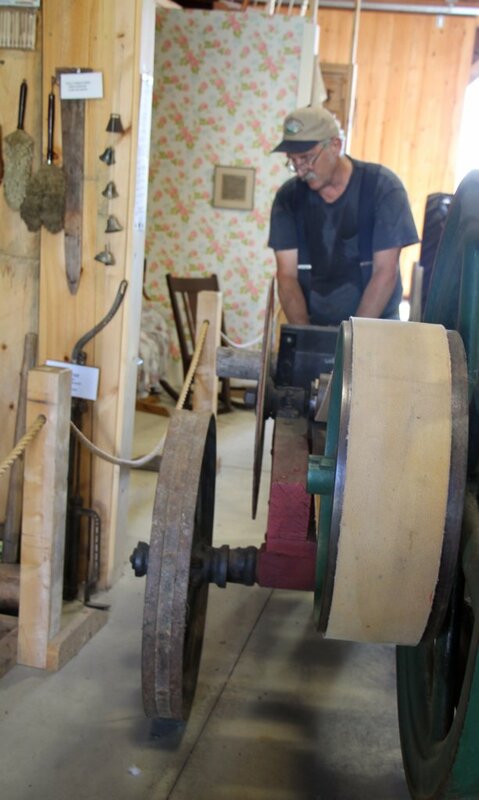 In the Agriculture Museum, Jeff O’Donnell has spent the past few weeks dusting and organizing artifacts and equipment. O’Donnell, who has been head of the museum for two years, said he has always been interested in agricultural history. Worthley Arena will be the location for several new events for children, fair secretary Neal Yeaton said. On Sunday, Sept. 16, at 2:30 p.m., there will be a country-themed costume contest for 3- and 4-year-olds. Children ages 5 to 8 can take part in a pie-eating contest Thursday at 5:30 p.m.
“They will have nice, gooey, chocolate cream pie with lots of whipped cream,” Yeaton said. Also new this year is the Junior Farmers Frolic on Saturday, Sept 22, at 10 a.m. in the show ring, weather permitting. Children will have the chance to try their hand at general farm chores such as shoveling sawdust and handling hay. They can also experience milking a cow. “Not with a real cow, mind you, but by using a feeder-type bottle,” Yeaton said. Each day a boy and girl will win a new bicycle. Sign-up for the daily drawing will be in the exhibition hall. The drawing will take at the gazebo Sunday and Saturday at 5 p.m., and Monday through Friday at 6 p.m. Children must be present to win, Yeaton said. The demolition derby will take place Saturday at 7 p.m. at the race grandstand. Yeaton said the purse has been increased and the overall winner of the derby will go home with $1,000. Drawings for two cars will also be held during the derby, Yeaton said. Tickets are 3 for $5 and can be purchased throughout the week. For more information and a full schedule, visit www.farmingtonfair.com.